This high performance 1 by 2 HDMI splitter distributes one HDMI input to up to two simultaneous HDMI outputs and supports 4K×2K, 3D, 12-bit Deep Color as well as High Definition Lossless Audio. 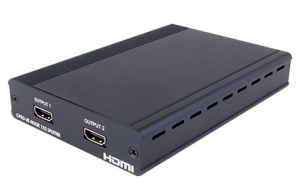 With its 3Gbps bandwidth it supports the latest HDMI standards so you can be sure of superior HDMI distribution. Note: When displaying a 3D signal with a higher bandwidth than 225 MHz or a 4K×2K resolution source, a High Speed HDMI cable is required.